While in Manila we stayed at Greenhills Elan Hotel Modern, which had rooms for P3400/night (about $70/night at the current exchange rate). 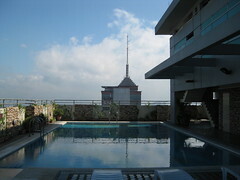 One of the taller buildings on Annapolis Street facing towards Greenhills Shopping Center, Elan is actually a mixed residential building, consisting mostly of condos, with guest rooms on three of its thirty-eight floors set up for hotel use. You wouldn’t know it from the lobby, restaurant, and 24 hour front desk though — and really, three large floors is a decent size for a hotel. This was much better than last year’s condotel experience, in which we were effectively subletting a room without any additional services. Elan was an actual hotel, with housekeeping, minibar, air conditioning, cable TV, breakfast buffet, roof-deck swimming pool, and actual hot running water in the shower. The bed was just right, with a nice, thick comforter-like blanket. On the down side, the breakfast buffet was occasionally marred by various insects appearing on plates, in milk, or in coffee; and the the tub was a bit small, awkwardly sloped, and rather high up off the floor so one had to step down quite a ways to get out while simultaneously avoiding slipping on the sloping tub wall. First time I’ve had to use those bathroom wall bars meant for the elderly and disabled. Lights in the room were a bit dim, too, but that wasn’t too much of a problem. We had some rather annoying keycard problems the first two nights, too, but those were eventually fixed. Other than that, the service was great, the room nice and clean, the staff courteous and helpful, and the location perfect for our needs. Right across the street is the daytime gate to Greenhills Shopping Center, form which you can go left to Promenade or right to Virra Mall. There are two laundromats in the immediate area (cheaper than the hotel laundry service), and a 7-11 and two Asian food markets right nearby, not to mention all the restaurants right across the street in Promenade. 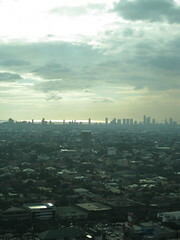 And the southwest-facing view from our 37th floor room was exquisite, covering Greenhills, Wack Wack, Makati, and right up to Manila Bay. Definitely a keeper, for a good price.